Don't expect good performance to show up just because you're using a glyphosate tank mix to control Roundup Ready volunteer corn. Ordinary adjuvants won't do the job. Simplyx is designed to optimize the performance of glyphosate and its tank mix partners, and it's proven. Make your fields and yields look good with Simplyx. 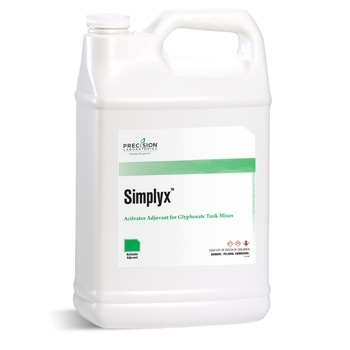 Simplyx is a low-use rate, activator adjuvant blend designed to maximize the performance of glyphosate, and its tank mix partners, on hard-to-control weed species. Simplyx effectively replaces the need for ammonium sulfate with glyphosate tank mixes by sequestering antagonistic hard water ions, maximizing cuticle penetration of both water-soluble and oil-soluble herbicides, and protonating weak acid herbicides for rapid absorption and transportation.